There's a little island in the Chesapeake Bay across from (to the west of) Chincoteague Island in Virginia. It's near where the wild horses swim. I could tell you a couple of good stories about going there as a kid with my family, and two other families, with tent trailers and Coleman stoves and experiencing, on night one, an intense midnight soaking that require a laundromat at 2-4 a.m., but I won't. It was one of the few vacations we ever took. But I'll just say that the place saw nightly clouds of DDT pouring out the back of jeeps and directly into the lane where us kids played. Tangier Island sits in the middle of the Chesapeake Bay, and it's going underwater from sea level rise (mostly) and erosion. About 450 people live there, on 1.3 square miles, and it seems to be a pretty closed, insular group. None of them seem willing to accept global warming or its consequent sea level rise. They think their problem, which involves about 15 feet of lost beach per year, is all due to erosion. Trump has encouraged this view by stupidly telling them not to worry about sea level rise. The Island's mayor said, “He [Trump] said that ‘your island has been there for hundreds of years, and I believe your island will be there for hundreds more.’” 87% of the islanders voted for Trump in 2016, because he was "the Christian candidate." Fools. But they're not going to be just fine. They're going to get shoved off their island, and in just a few decades, by the ever rising sea. Doubtless they still won't accept global warming and its sea level rise even at that point, but will, sadly, invent a way to blame Democrats and gays and progressives and liberals and queers. They'll be in the earliest band of US climate refugees. There's a book out in the last few months, Chesapeake Requiem by Earl Swift. He lived on Tangier Island for a year, talking to "cantankerous" people who, I'm guessing, didn't really want to see his face every day, reminding them of their predicament and their denialism. But this is an easy call. Now the federal government, via the Island's Virginia Congressman, is giving them a half million dollars ($495,000) to build a jetty, whose ultimate cost will be $2.4 million. This would make sense if their problem really was just erosion. But most of it is not. Like a placebo, a jetty might do something for a couple of years or ten, but it won't cure the disease. I don't know where the others $1.9 million will come from -- US taxpayers, probably. Add it to the list. 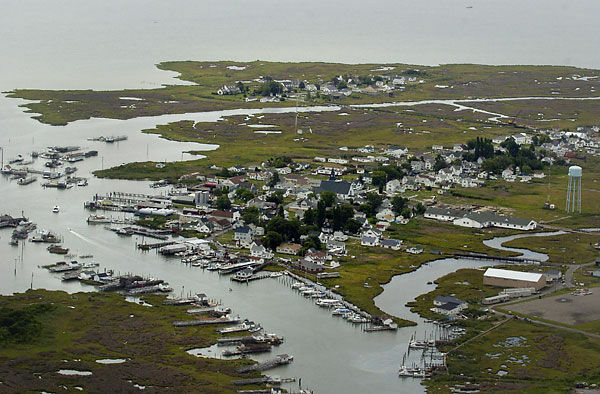 Only about 450 people live on Tangier Island, so we're talking about a hefty $5,300 per person. All for a fix that won't last because people won't accept the science and the reality of carbon dioxide and anthropogenic climate change. I can almost sympathize with these residents. Almost. I do wish the people who live on Tangier Island could stay there forever, catching fish and crabs and watching Orioles games in the evenings. It does seem they have a deep, wonderful (though insular) community. But it won't be, and there will be many more dispossessed after them. This business is just getting started. Ad it's going to break an enormous number of hearts before it is through, if it ever is. Models are now predicting that Hurricane Florence will hit the East Coast and stall there for several days, inundating Tangier Island. I’d be inland for this one. Sadly, doing something to delay inundation for a few years may be the best Tangier Island can do. They can't stop sea level rise. The weak Paris Agreement shows that the world is unwilling to make the sacrifices necessary to actually reduce the CO2 content of the atmosphere. Even if atmospheric CO2 could be magically reduced, natural forces might continue to raise sea level, albeit at a slower rate. Surrounding the island with a dike might work, but it would be too expensive for just this handful of people. We should take Tangier Island as a warning. In the future, their problem will be replicated in low-lying areas all over the world. Fortunately, sea level rise is slow, so we have a lot of time. But, we'd be wise to develop dike technology. David, what do you think is causing natural sea level rise? To the extent the planet would naturally be slightly cooling in recent decades, sea level should be falling, not rising. "Models are now predicting that Hurricane Florence will hit the East Coast and stall there for several days, inundating Tangier Island." That's a good point. An area won't be abandoned when sea level rises to someone's front porch steps, but years before, when large storm surges flood it, or when the sea inundates their water supply, or when insurers will no longer insure against flooding, or when banks and mortgage companies won't loan money to homebuyers. David -- you make a good point. I am no expert. I could only guess what is causing natural sea level rise. Perhaps the slow warming of the planet since the end of the Little Ice Age is the cause. (I believe there is widespread, but not universal, agreement that the LIA affected the entire planet.) Or, maybe changes in precipitation patterns are causing glaciers to slowly shrink. But, these are just my wild guesses. David - BTW insurers will insure commercial risks against flooding, but not personal risks. Flood insurance on private homes can be purchased from FEMA, an arm of the Federal Government. The Little Ice Age took place between the 16th and 19th century. Whatever sea level was lost to the LIA was gained back quite quickly in the 1800s, and has since risen several times that amount. The trajectory we're currently on will make the LIA hills and valleys insignificant in short order. As you note, the current "natural" contribution to sea level rise seems likely to be negative. David: At some point, even FEMA and NFIP will stop insuring some houses. Hopefully! "The federal government holds a monopoly on primary flood insurance for homeowners and businesses, and the program is debt-ridden and dysfunctional. The NFIP owes taxpayers nearly $25 billion as a result of borrowing from the U.S. Treasury to cover damage claims"
It's taxpayers who are going to pay for homes and businesses damaged by sea level rise -- there just isn't anyone else, in the end. It's crazy that the government has a monopoly on flood insurance in the US. This will result in a broken market that doesn't respond to climate change. Curiously, it seems like overland flooding is relatively new in Canada because flooding used to be such a rare occurrence. I know it's become a real problem in Toronto where it seems to flood every year now. I almost lost my car in a 'puddle' a few years back. The conservative representative in charge of infrastructure has been blaming climate change, but I can't help but think that poor infrastructure planning has something to do with it. Traditionally, private insurance would not cover flood on personal dwellings (although they did cover flood on some commercial and industrial policies). When homes are built in areas of frequent flooding, the fair flood premium is unaffordable. E.g., if a house is flooded every 20 years, the flood premium would have to be 5% of the value + an overhead charge. The average Homeowners policy premium is 0.6% of value. The National Flood program was started with good intentions. Some excellent engineering was done to determine whether a house was located in a flood zone, and, if so, what frequency of flood. The rates could be set based on actual risk. Extremely high rates for exposed areas would discourage building in flood-prone areas. Unfortunately, that premium structure didn't last. People who owned houses in flood-prone areas lobbied to get affordable premium rates. Lower flood insurance rates make it easier to own a home in a flood-prone area. Thus, a program, originally designed to discourage construction in flood-prone areas, now encourages construction in flood-prone areas. Thanks DiC. Interesting. Is there any political will to back out at this point and allow the market to work? It seems like something inside the wheelhouse of the republican party and an area where they could do some real good. Rather than yank the carpet out from under folks, maybe they could start by limiting coverage to $1,000,000 and let private insurance cover the rest. Then slowly lower cap over time. Layzej - I know of no such effort. I like your idea, but I don't it's going to happen. Recall that the private market never wanted to cover flood. And, federal programs seldom shrink. One cat bond that could be triggered by Florence was issued by the Federal Emergency Management Agency in July to help cover flood losses. Florence is expected to pound the Carolinas with rain and could cause significant flooding. While homeowners insurance typically covers damage from hurricane winds, homeowners usually have to buy separate flood insurance from FEMA’s National Flood Insurance Program. The FEMA cat bond would cover as much as $500 million of the NFIP’s losses for a single event, but only if those losses exceed $5 billion. The NFIP paid nearly $10 billion in claims following hurricanes Harvey, Irma and Maria in 2017. The cat bond and other reinsurance puts the NFIP in a “better position to manage losses,” NFIP Chief Executive David Maurstad said last month. To me, that last sentence sounds like an excuse for making some bad financial decisions that lost a lot of money.